All of the awesome stores below are hosting 2017 Twin Cities Geek Holiday Toy & Book Drive donation boxes! So why not take advantage of the deals to add to one of the boxes before you leave the store, and make someone’s holiday brighter? It feels really good to do good—we promise. Music geeks rejoice, because your favorite independent music and hip-hop stores are really delivering with their specials and releases this year. Check ’em out! *Sale excludes gift cards, tickets, tobacco products, Mix & Burn CDs, and yellow-tagged music already on sale, including exclusive Black Friday Record Store Day releases. 7-inch record of Aesop Rock‘s newest single, “Hot Dogs,” will be available in store only—limited quantities, and once they’re gone, they’re gone! Now is a great time to stock up on cosplay, craft, and art supplies from some awesome local businesses that will help you find exactly what you—or those special someones on your gift list—need! *Fabric discount will apply to cuts of ½ yard or more; does not apply to precuts or sale fabrics. Yarn from MeadowLake Fibers and Sunshine Fun Yarns will not be discounted. Free hand-lettered gift tags by Kaytee Crawford on Saturday from 11:00 a.m. to 3:00 p.m. Huge holiday sale (through December 31)! Are you or is someone in your life a Japanophile or otaku? Then you definitely won’t want to miss hitting up these local stores that specialize in goodies from Japan for special discounts. Be sure to check out Tomodachi’s Mall of America store too for similar tasty incentives: strawberry Hi-Chew at $25, green-tea Pocky at $50 and green-tea Kit Kats at $100. *Does not include new releases from November 22, merchandise already on hold, or special orders. 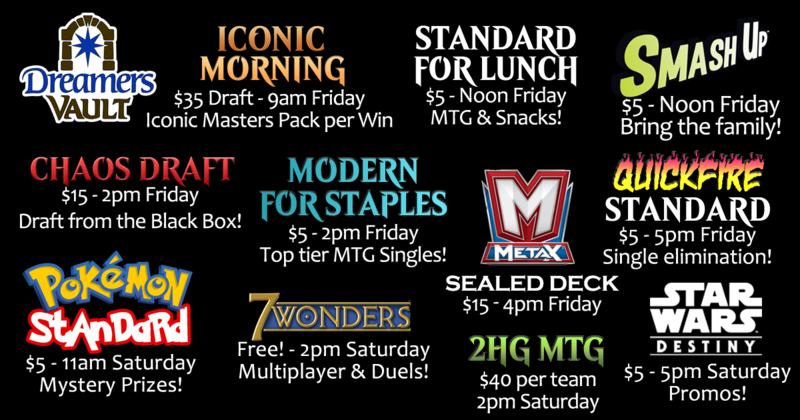 $15 Iconic Masters modern at 2:00 p.m.
Black Friday and Small Business Saturday 2017 Events at Dreamers Vault Saint Louis Park. 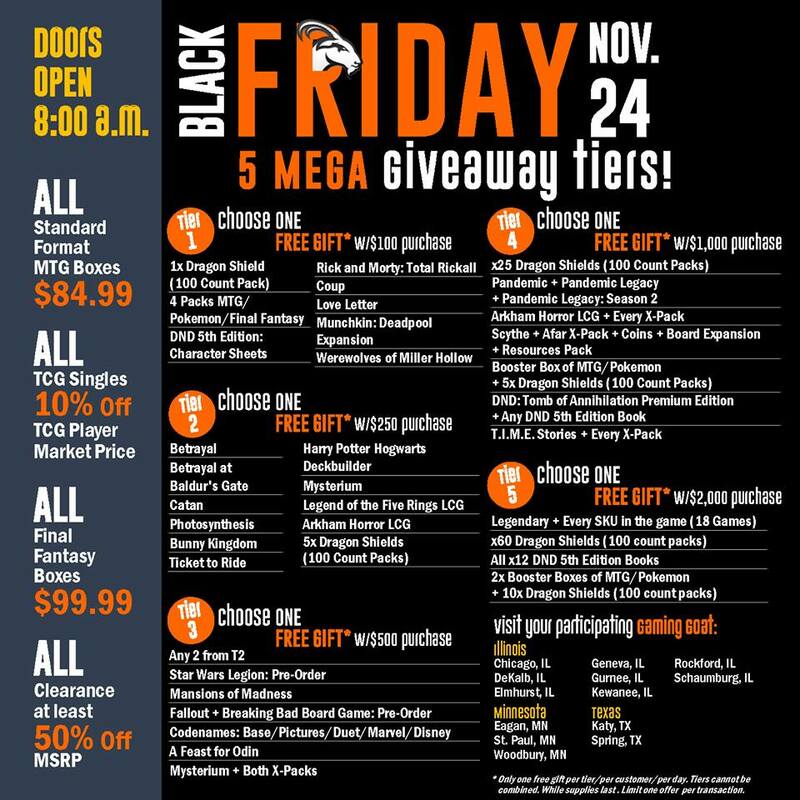 Free gift tiers at the Gaming Goat on Black Friday 2017. *Some exclusions apply. While supplies last. Rain checks available on some items. 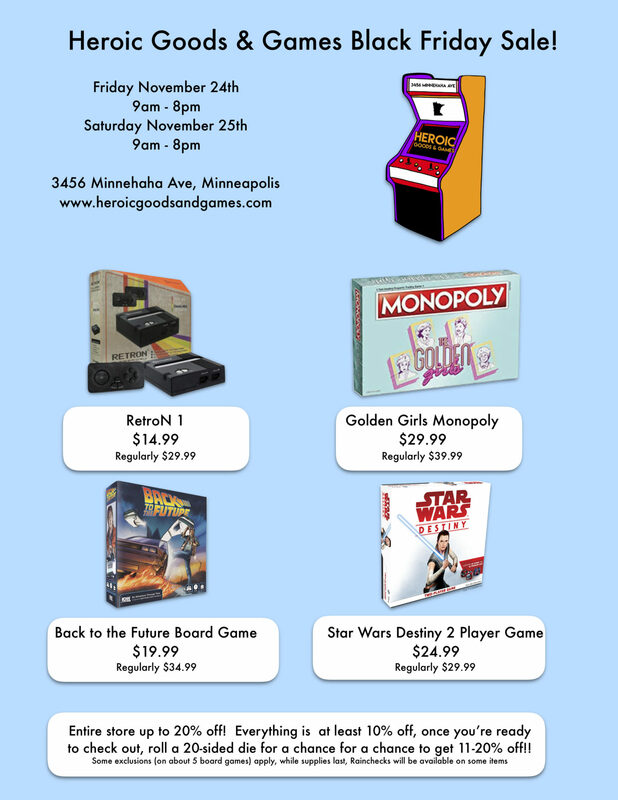 Special Black Friday and Small Business Saturday 2017 markdowns at Heroic Goods and Games. Get an additional 10% off your purchase on top of the discounts below when you donate an item to the Twin Cities Geek Holiday Toy & Book Drive! Giveaways at the Iconic Masters draft starting at 7:00 p.m. Note: This store will be closing December 30, 2017, so you don’t have many more chances to visit! Many items are already discounted. Buy three dice, get one free! 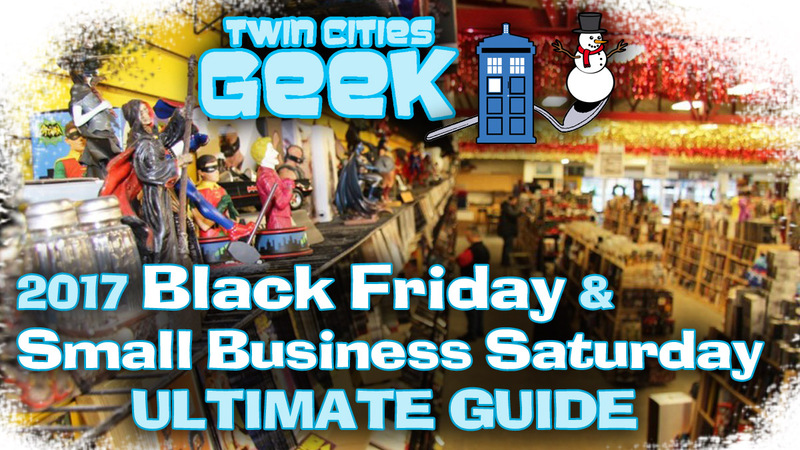 As mentioned above, all of the stores on this page are hosting 2017 Twin Cities Geek Holiday Toy & Book Drive donation boxes. Curious what kinds of items we are collecting in the Holiday Drive or what organizations we’re collecting for? Click here to find out! And if you do add a little something to a donation box, snap a selfie and share it on Twitter or Facebook with the #GiveTCG hashtag to show all your friends! The Fantasy Flight Game center, though cool for supporting the Geek Toy & Book Drive, is no longer a local business. The FFG EC was originally owned by Fantasy Flight Games, who was aquired in 2016 by the Asmodee group (FFG split in part to become FFG Studios, Windrider Studios, and Asmodee North America). The Asmodee group is a multi-national, multi-million dollar corp. It is in no way shape or form small business, like Dreamhaven, Dreamers, or the Source. Again, thank them for hosting a box in their doorway, but did you do any research on the businesses you promote as “local”? I don’t feel I can trust anything on this list, particularly since the Asmodee acquisition was pretty big news. If you just care about stores close to you, shop at Target. They are a ‘local’ company by that standard, employing thousands of Minnesotans. Because FFGC’s corporate parent, Asmodee North America, is headquartered in Roseville, MN, they are indeed still locally-owned, if no longer a small business. But, we never said everyone on this list was a small business.